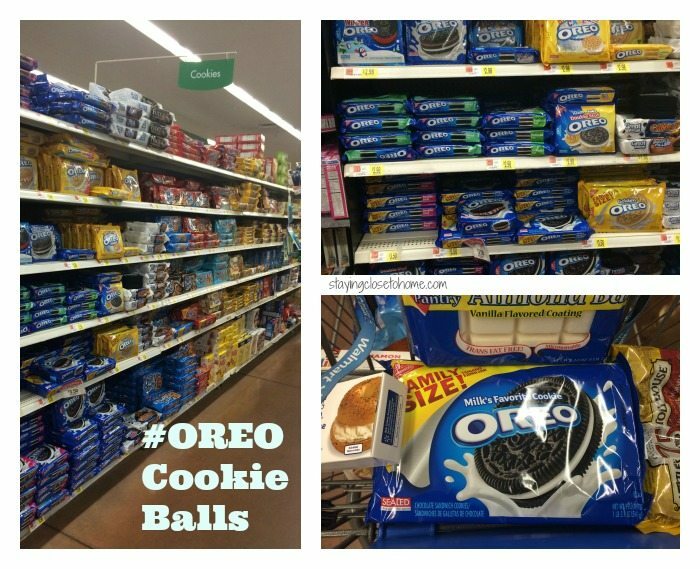 This shop about Holiday #OREOCookieBalls has been compensated by #CollectiveBias, Inc. and its advertiser. All opinions are mine alone. Every year, he favorite cookie at my cookie exchange is the OREO Cookie Balls. Why wouldn’t it be? Not only is it pretty simple to make, but who would not love crushed up OREO cookies, and cream cheese dipped in chocolate? You will be surprised how much you like them if you have never had the chance to taste one. But today we are sharing some holiday inspired OREO cookie balls ideas. When thinking about holiday OREO Cookie Balls the first idea that came to my head was to create ornaments. Why not they are round right? While shopping for the ingredients at Walmart, in addition to the OREO Cookie Ball ingredients, I picked up some mini peanut butter cups, string licorice too. To make the ornament tops, simply melt some milk chocolate, dip the tips of a 1 1/2 inch strip of licorice into the chocolate and hold on to the top of the mini peanut butter cup. 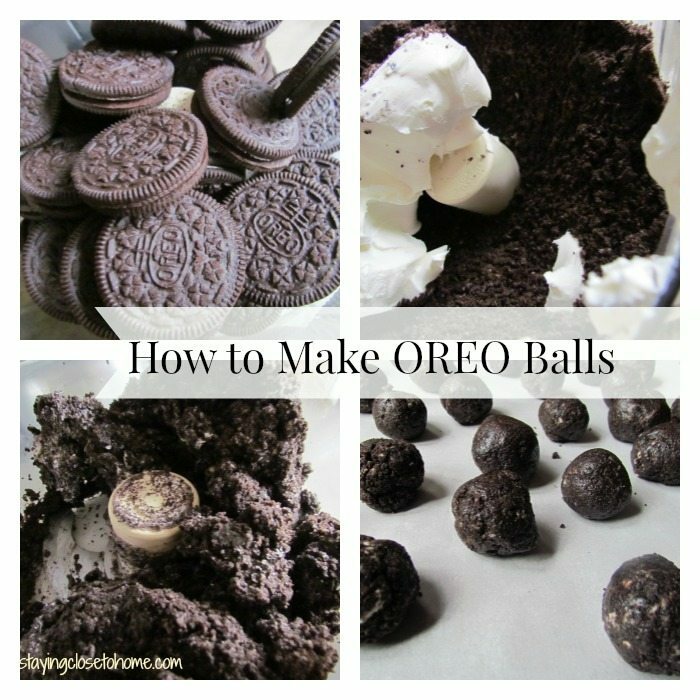 This can be tricky so plan on working slowly and do this before you start dipping your OREO cookie balls into the chocolate. Once you dip the OREO balls into chocolate attach the ornament topper and decorate with sprinkles or melted chocolate. Another idea that came into mind since I was using red and white candy coating for the cookie balls was to make them into a candy cane shape. Just make an equal number of red and white OREO Cookie balls and layout in a candy cane shape onto a serving tray. Still needing another way to display my Holiday OREO Balls. I decided to attach them to an inexpensive cone I purchased at a dollar store. I cut toothpicks in half and used them to attach my OREO balls into the stryofoam. TIP: Work around the cone so it wont tip and crack some of your cookie balls. This sounds so good, but at my house I don’t think they would last long enough to be made into ornaments. Festive and delicious…what more could you ask from a holiday treat? I absolutely love the way you displayed these!! Oreo Balls are one of my favorite treats! 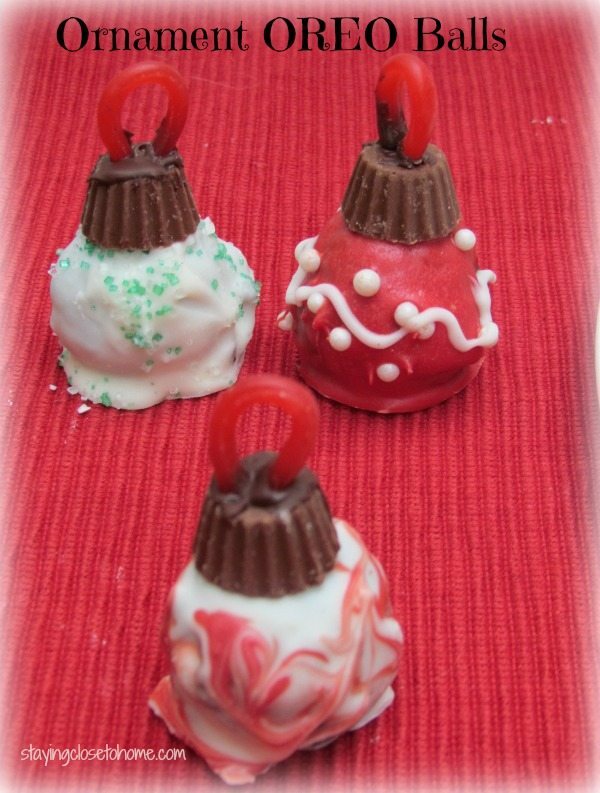 I love the idea of adding the peanut butter cups to make them look like ornaments, SO cute! That is awesome. I will have to do this one. Ok I will swap you these balls for some of my potato enchiladas. These look so yummy. This is such a cute idea. I am sure it is a big hit with your family. I love this idea. You always come up with some of the coolest ideas. I know my boys would want to eat them though so they probably wouldn’t make it to the tree. These are really cute. We might make these for one of our Christmas treats. I love your Oreo Cookie Balls tree. That was a great idea! Oreos aren’t a favorite of mine…well, I like the cookie..not the inside creme. However, I know two people in my house that would devour these up. And as I write this – I bet I could make myself a version of these – just leave out the middle. The way you display them, is creative – great job! I can’t believe how creative this is as well as all of the different types of candies/cookies/etc. you have added here. This looks so deliciously divine and would be so much fun for me to make with the grandkids over the holidays. That is so cute! I love how it turned out! Looks great! What a great tree! Can I come over and help you un-decorate? How have I never heard of Oreo cookie balls?! Will definitely be making these! What cute “ornaments” you made there! My daughter used to eat Oreos almost every week. I bet she would love these. Oh my! Adorable and yummy! Such a fun idea! What is it about that simple and nostalgic cookie? Anything made with Oreos gets my approval. I love them! Oh my, so cute! My family would love these – pinning this right now! Thanks for sharing! Great idea! Looks so festive and yummy!